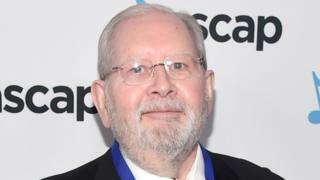 Emmy award winning composer Alf Clausen who has written music for The Simpsons for 27 years has been fired. Clausen told Variety that he received a call from Simpsons producer Richard Sakai, who said the company was seeking "a different kind of music". He confirmed the news on Twitter and thanked fans for their support. There is speculation that it is the result of cost-cutting on the long running animation. Clausen used a 35-piece orchestra every week. Speaking in 2015, he said he was very strict with the budget because he appreciated how much using a large orchestra each week cost, but said the bosses at The Simpsons did not hassle him over it. Clausen won an Emmy award for his 1997 song We Put The Spring In Springfield from the episode Bart After Dark. He also won an Emmy for the 1998 song You're Checkin' In from the episode The City of New York vs. Homer Simpson. He was nominated a further 18 times at the Emmys and has also won three Annie awards. Clausen produced The Simpsons albums and collaborated with many of the show's musical guest stars, including U2. Family Guy and American Dad creator Seth McFarlane tweeted it was "sad news". "He reinvented the sound of prime-time animation. I hope The Simpsons keeps the orchestra. Big part of a great show." Writer Kaleb Horton said: "Alf Clausen is as important to that show as some cast members, so the decision, like the daily decision to let the show live, is appalling." Composer Austin Wintory praised Clausen as "one of THE most respected composers in Los Angeles, and one of the few "old souls" who can handle super traditional writing," and called his firing "the end of a true dynasty". Film reviewer Stefan Ellison described it as "shocking news." "They mention cost-cutting. Makes me wonder if those yellow Springfieldians are winding down." Last year The Simpsons was renewed for season 29 and 30 making it the longest-running scripted TV show of all time in the US.